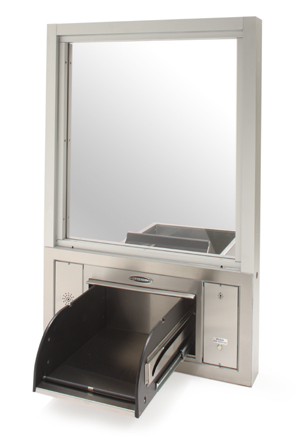 The Q-TRAN-713S Drive Through Transaction Station is a pre-designed drive thru combination window/drawer/intercom unit. This unit is glazed with Level 1 Bullet Resistant Glazing for security. This station has the QSP-713S Drive up Transaction Drawer with speaker , already installed in the framing. An Audio Authority Intercom System completes the package. This one piece transaction station comes with mounting brackets for easy installation at the job site. Color: Clear Anodized Aluminum or Dark Bronze. Size: *Inquire for other sizes. The Model QSP-713S (speaker) offers a hefty transfer area. This drawer was designed to provide easy performance when transferring large and bulky items. It works exceptionally well for pharmacies and bank commercial customers. With a transfer area of 13" (w) x 7 1/2" (h) x 18" (d) this drawer is large enough to efficiently pass the largest of prescriptions, as well as convenience items like bags of ice, a gallon of milk or a fridge pack of beverages. Drawer can support up to 150lbs. Smaller items such as credit cards, cash and prescriptions can be easily transported as well. This multi-channel intercom system is perfect for gas stations, pharmacies, banks, and pay stations for municipal utility districts. This system will work with every Interbank/Quikserv transaction drawer.